Exclusive collection from Emmy! 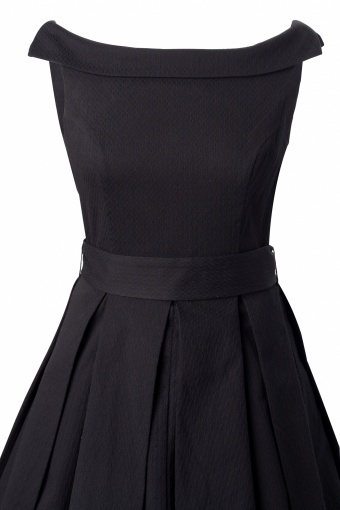 The 60s Celebration Dress in Black is so beautiful in its simplicity that you can even wear it for your wedding! This dress is a dream with nice 60s Jacky Kennedy inspired detailing. Made of high quality heavy coton with a Jacquard structure and a little stretch for that extra comfort. Sophisticated boatnecked collar in front that ends in a more flirty V-neck in the back. It has a clever detail at the shoulders to fasten your bra straps on the inside so you don’t have to worry about looking sloppy. 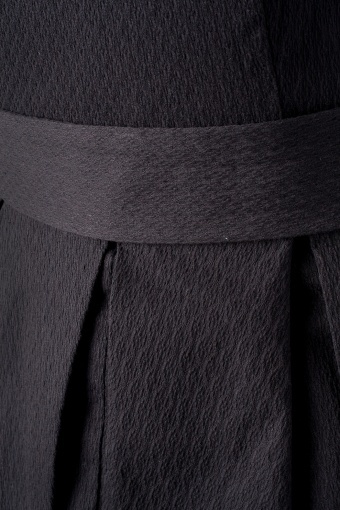 The skirt is full and with box pleats which are very flattering: they don't make your hips look bigger and it comes with a wide belt to tie around the waist and to emphasize your waistline. To give it more drama you can wear it with a petticoat as shown on the pictures.